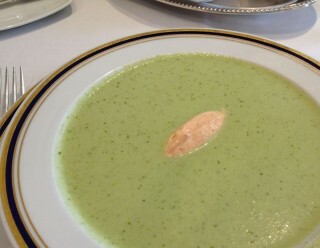 DesBrisay swooned over the chilled cucumber soup, a gentle jolt of heat delivered by a spoonful of smoked paprika yogurt. ‘Le Cordon Bleu Bistro @ Signatures’ is not a name that has ever tripped off the tongue. (Or maybe “tripped” is precisely the right word.) It was re-christened as part of the 2009 rebranding of a restaurant that used to be called, simply, “Signatures” (though with the tagline “by Le Cordon Bleu Ottawa Culinary Arts Institute”). Signatures was a pretty fancy place; a restaurant to which you made pilgrimage. There were many menues, assorted dégustation options, dishes were complex and elegant on the plate, and the front of the house team was large and accomplished. That was then. People tend to prefer to flop into places that dish up gourmet macky cheese and bacon ice cream now. They don’t much like pilgrimage places. Today, I use Le Cordon Bleu Bistro @ Signatures more for lunch and I come on a fairly regular basis. I love this old house and its quiet charm. The room is elegant, private, the food typically very good, and the price is right. 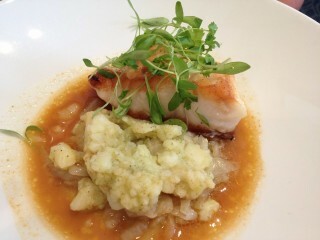 The Ling cod is set in a pool of poaching broth beside a rough mash of fingerling potatoes. Pricing for the three-course menu du midi is straightforward and, in four years, has climbed from $25 to a whopping $26. The table d’hote changes every week and can be viewed online. Last week it began with chilled soup (if ever there were a week for chilled soup last week was it). Cucumber was the flavour, delicate but absolutely there, with a gentle jolt of heat delivered by a blob (carefully molded and carefully positioned) of a thick and creamy smoked paprika yogurt. Seasoning was bang on. Next up, Ling cod, a nice thick hunk of it, with a fine buttery crunch on the outside, set in a pool of poaching broth tweaked with Spanish espelette pepper. It came with a rough mash of fingerling potatoes. The lemon buttermilk sorbet was outstanding and was the only thing that kept us attempting at least a few bites of the kouignette, a doughy strudel of cinnamon and pistachio. Le Cordon Bleu Bistro @ Signatures, 453 Laurier Ave. E., 613-236-2499.